The crew listed above had flown three operations together, to Berlin. Lancaster ND462 was shot down by a night-fighter, probably around 20.35 hrs on the evening of 30th January, crashing in flames near Loburg, about 15 miles east of Magdeburg, apparently on the return route. It is likely that they bombed on time, about 20.13. A witness to the crash interviewed after the war cited the night-fighter attack and that the Lancaster was in flames and exploded on the ground. Although the remains of the crew members could not be positively identified a watch belonging to Bennett Schultz was eventually recovered, associated with the crash site. Who were these young men, all wrapped in a single parachute and buried in a communal grave in Loburg cemetery? Warren Ainsley Roberts – date of birth July 4th 1920. His father Joseph had been brought up on a small farm on Anglesey, Wales and emigrated to Canada in August 1910. He worked on the farm next to the Bowen family at Birtle, Manitoba and married Bessie Bowen on 21st April 1919. Warren originally applied to join the RCAF in November 1939, attestation papers dated May 1940 being accepted into aircrew Special Reserve. ‘I am very anxious to learn to fly and have been trying to get into the air force for almost a year’. Warren did become a pilot and applied for a commission as LAC (entitled to wings) dated March 8th 1941 – ‘I am anxious to get a commission and have always wanted to make my career in the Air Force.’ He was commissioned to P/O rank 18/3/41. Dress:- conservative, clean and neat, smart. Farmer’s son, Very fine type, Alert, Keen, Will improve with training. 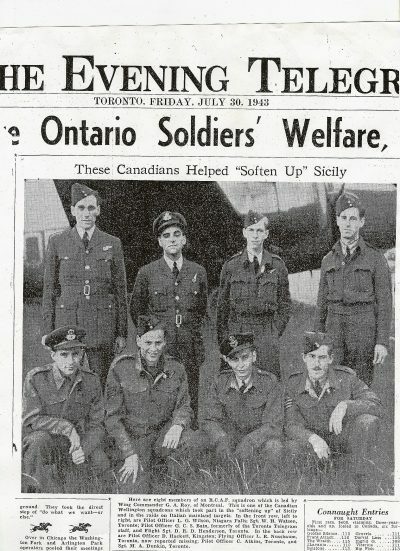 Whatever ambitions he had Warren was earmarked as having potential to make a capable flying instructor – which he did – serving as an instructor to fledgling pilots at 11SFTS RCAF Yorkton, Ontario from June 1941 to September 1942 when he was posted to 2FIS (Flying Instructor School) Vulcan, Alberta, presumably to instruct instructors a posting which lasted until July 1943. So, two years and four months after graduating as a pilot Warren Roberts embarked for the UK and the prospect of operations. In early October 1943 F/O Roberts arrived at 24OTU RAF Honeybourne – about 5 miles east of Evesham and on 1st December was posted without a crew straight to PFF 405 Squadron. He was immediately on attachment to NTU (PFF Navigation Training Unit) – flying Halifaxes, apparently his conversion training to four engined, heavy bombers. Three days after Christmas he was returned to 405 to commence operations. Pitched straight into the ‘Battle of Berlin’. F/Lt Warren Roberts flew two ‘second-dickie’ trips with F/Lt G Bennett DFC and crew on the night of Saturday 1st/ Sunday 2nd and 2nd/3rd January, both sorties to Berlin in the role of Primary Blind Marker. Wednesday 5th/ Thursday 6th – target Stettin – Roberts, Moore, Hackett, Stevens, Boileau, Reid , Pyke. ”H” up 00.04, dn 08.13. bomb load 4×2,000 H C – Supporter. Visibility was clear at aiming point with half-moon setting. Load was released on a cluster of about 30 Red T I at Aiming Point which was recognised from a height of 17,500 feet at 03.41hours. On run-up attacked by Ju88. Evasive action was taken, and ran on to target with no damage to our aircraft and no claims made to enemy aircraft. Flares were seen lighting up target and two Green T Is were falling South-west edge of town. Some Green T I were on centre of town. No fires were seen. Landed base undamaged. Randolph had emigrated aged 8 in October 1923 with his grandmother Ada K Sabunjie and aunt, Cecelia M Sabunjie on P &O SS Balranald to Fremantle. F/O Moore disappears from immediate squadron records after this sortie. However, Randolph survived the war, returning to Australia. ‘I have pleasure in certifying to the good character of Mr Douglas Hackett of Kingston, Ontario. He is a member of St Andrew’s Church of this city, and highly esteemed by all who know him as a young man of ability and integrity. I believe that he will make good in any work he undertakes.’ John W Stephen, Minister Emeritus, St Andrew’s Church, Kingston. April 12th 1940.
b 4th May 1920, father William Hackett, postal clerk, mother Ada (nee Moncrief) family home – 69 Ordnance Street, Kingston, Ontario. Brothers – Stewart, Herbert (Herb), Kenneth and William, sister Laura. Sports – Rugby (extensively), swimming (extensively), baseball, tennis, basketball. Flying experience – 1 hour as passenger. height 6’3”, 180lbs, fair complexion, hazel eyes, brown hair. No 4 EFTS Windsor Mills, Quebec – pass position in class 8, number in class 26 – recommended for training on twin engine aircraft. Disappointingly for Doug he was ‘washed’ from pilot training and re-mustered as an air-gunner, but soon relented and re-trained as an Observer, graduating and commissioned to P/O 3rd July 1942. Doug Hackett disembarked in the UK 18th August 1942, next stop No 3 (Observer) AFU RAF Halfpenny Green 26th August 1942.
a/g Sgt M G Anderson RCAF. Operations started in early February 1942 with mine-laying and bombing European targets until mid- April when 424 Squadron was stood down to prepare for transfer to NAAF (Northwest African Air Forces) – proceeded overseas to North Africa 1st June 1943 to operate against targets in Southern Italy. Doug Hackett, far left, rear rank. The crew returned to Britain ‘tour expired’ 8th October 1943 and F/O Hackett was posted to 23 OTU RAF Pershore 23rd October 1943 as an instructor. His ‘rest’ stint ended with a move to 405 Squadron at the beginning of December, attached to Pathfinder Navigation Training Unit 5th – 19th December 1943 when he returned to the squadron. Sgt Reginald Ralph Stevens – W/op 5th/6th, 14th/15th January. 1393048 Sgt Reginald Ralph Stevens b o/n/d 1921, Greenwich. kia 21/1/44 age 22, son of (Frederick) Charles and Ada Mary Stevens of Hither Green. Service number issued by Euston recruiting centre range August 1940 to December 1941. The 1939 register places the Stevens family at 14 Woodlands Street, Hither Green,south-east London. At the beginning of January 1944 ‘Rogers’, as he was known held the rank of Warrant Officer, by the end of he month he had risen to P/O and had been appointed gunnery officer. Rogers Boileau – French speaker, English moderately well. brother – Jean Robert, address 44 Paré Granby, Shefford County, P.Q. 5’7” 145lbs, fair complexion, blue eyes, blond hair. ‘Keen, bilingual, Very anxious to join the Royal Canadian Air Force. Polite, well-mannered. Should do well as WOAg’. At No. 1 Wireless School in Montreal Rogers encountered some disciplinary problems due to a couple of unauthorised absences, not an uncommon occurrance, which were sorted out by pack-drill, forfeiture of pay and detention. His training progressed at No. 4 Bombing and Gunnery School, Fingal, Ontario where he gained his air-gunner’s badge and Sergeant’s tapes on 31st March 1942.
were posted to 425 Squadron, an RCAF squadron composed mainly of French-Canadians and based at RAF Dishforth in Yorkshire. The squadron operated Vickers Wellington bombers, with the Rivard crew making operational sorties over the Bay of Biscay, Germany and Italy. When 425 Squadron were transferred to the NAAF on 1st May 1943 the crew did not join them, but were posted to 432 Squadron and completed their operational tour from RAF Skipton-on Swale on 7th August. Rogers Boileau began a four-month stint as an instructor with 15OTU at RAF Harwell, Berkshire, under the auspices of 91 (Training) Group but looked forward to a return to ops, arriving at 405 Squadron on 14/12/43. 12th February 1942- Sea Search (Operation ‘Fuller’) attack on German Navy’s capital ships Scharnhorst, Gneisenau and Prince Eugen – ‘the Channel Dash’. 22nd February 1942 – Norway (5.15) 15 aircraft – 6 halifaxes, 5 Manchesters and 4 Stirlings bombed four Norwegian airfields in diversion for proposed Fleet Air Arm strike on Prince Eugen. 3rd March 1942 – Paris (5.30) Renault truck factory, Billancourt. After a break of 20 months he resumed operational flying with 405 Squadron, with Roberts on the sorties of 5th January to Stettin (8.09), 14th – Brunswick (5.24), 20th – Berlin (7.16) and 21st – Magdeburg (6.44). WO Reid came off ops for a spell, then resuming on 22nd April, and completing his tour on 18th August. Gordon Reid flew a total of 54 operations. ‘Warrant Officer Reid is a keen and reliable Air Gunner now on his second tour of operations. He has taken part in many sorties, which include such targets as Berlin, Stuttgart and Stettin. This Warrant Officer has always displayed a fine fighting spirit and determination to complete the most difficult tasks allotted to him. The excellent personal example set by the Warrant Officer has been an inspiration to all members of the squadron. Strongly recommended for the non-immediate award of the Distinguished Flying Cross.’ Award effective 4 November 1944. Gordon Reid survived the war. b June 1943, the eldest son of Mr Herbert Arthur Pyke and Mrs Nora Pyke of 18 Newburgh Street, Winchester. Norman Pyke was educated at the Lion School and Peter Symonds’ School, Winchester, and he then joined the staff of Messrs William Dibben and Sons Builders’ Merchants at their head office at Southampton. His father is well known as the Winchester manager for the firm. Sgt Pyke volunteered for the RAFVR in 1943 when he was eighteen years of age. It is probable that Norman Pyke joined Kenneth Wilson’s crew at 1658CU RAF Driffield in October 1943. Pyke was available as a ‘spare bod’ on 5th as Wilson’s crew were not on the Battle Order having suffered flak damage during the operation on 2nd/3rd January, which perforated the fuselage of ”T” and wounded navigator P/O Atkinson who received a shrapnel wound in the leg. ”O” up 16.56, dn 22.20. Bomb-load 1×4,000 H C, 6×1,000 M C, 4×500 M C (T.Inst.) – Supporter. There was 9/10 cloud at 10,000feet in target area. Load was dropped on centre of area marked by 3 or 4 T I Green and and 3 Flares Red/Green, at 19.27 hours from 19,000 feet. On approach, found fairly good concentration of 3 or 4 T I Green (seen through cloud) and 2 or 3 flares Red/Green in a position corresponding to EA on target from earlier H2S fixes. Landed base undamaged. Leon Loeb Speyer b 18th April 1922, changed name to Lloyd George Speyer. Religion – Goel Tzedec Synagogue – Hebrew. Father Boris Mark, born Vilna Russia, had changed his name to Ben Mark Speyer, emigrated to Canada 1911, naturalised 1914 d 26th Oct 1937. Lloyd Worked at the Globe & Mail Newspaper, Toronto in the editorial department for 2 years . 5’3 ¾” fair complexion, brown eyes, fair hair. NTU to 61 Base 30-12-43 and then to 405 Squadron on 6th January 1944. Sgt Ivan E Smedley RAFVR – flight engineer from 14th/15th January 1944. Sgt Smedley’s service number 1818902 – Birmingham Centre from July 1942 to October 1942. ‘My brother Ted Smedley joined the RAF in February 1943 aged 19. After training at 14 Training Wing, then Rootes Securities and 1659 Conversion Unit in Yorkshire. To 405 Sqn November 1943. 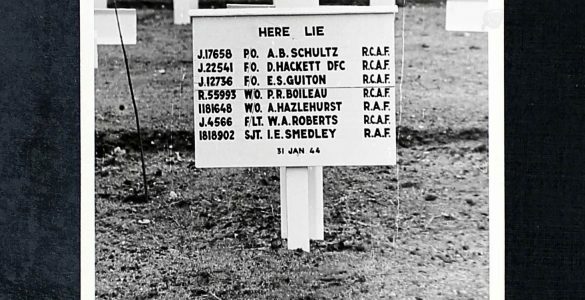 Sgt Ted Smedley had not apparently flown any operations during November, December or until flying with F/Lt Roberts on 14th/15th January.